We love growing rhubarb; it’s a refreshing change from winter roots, and grows vigorously at a time when English fields are otherwise quite bare. The variety is Timperley Early, with tender, juicy stalks and tart flavour. 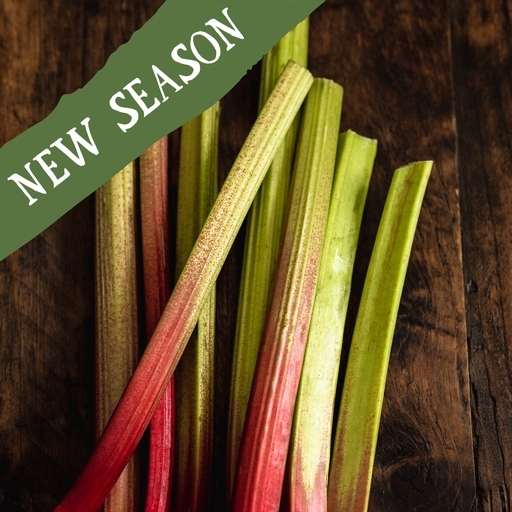 Unlike the bright pink ‘forced’ rhubarb you’ll find in most supermarkets, our rhubarb is field-grown, its blush-pink stalks tinged with green. Try our rhubarb and strawberry crumble recipe. Tart in flavour, rhubarb is at its best either stewed or baked. Wash carefully and remove all the leaf, then stew with sugar or bake. Young shoots can be eaten raw, dipped into sugar. Make a classic rhubarb crumble or compote with this seasonal fruit. Chop into batons, cook until tender with brown sugar and orange juice, then swirl into yoghurt for an easy breakfast. Its sharpness works well with savoury dishes like oily fish and roast pork too. For relish, simmer rhubarb with sugar, orange zest and juice, finely chopped shallots and dried chilli flakes for 20 mins, until thick. Keeps for a week in the bottom of the fridge. Stalks are pulled from late March to June or even later is the roots are strong. This rhubarb is fresh from the fields of our regional farms.